I noticed something odd about the behavior of one of my PC's upstairs...the browser was acting funny and saying something about OpenDNS, which wasn't really expected. Don't know how long this has been going on, but today it bothered me enough that I stopped it. OpenDNS is a virus. The people that own it say it isn't. Everyone with brain knows otherwise. I think that these people should be found and ceremoniously drowned in a fountain. We could flog them on Pay-Per-VIew from a third-world country. Let people pay $100 a head to watch their backs slowly turn into hamburger meat in the heat of the day. Start - Settings - Control Panel - Network Connections. Doubleclick my internet connection icon. 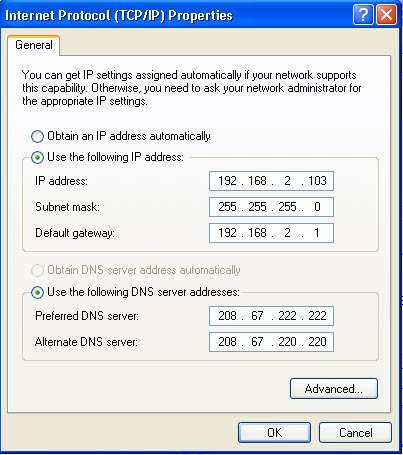 My TCP/IP DNS Servers both said "Obtain DNS server address automatically". So, I was thinking this would be my problem, but on my upstairs PC, this was not the issue. But I didn't have that. I had "Obtain DNS server address automatically". So, really, this looked correct to me. I decided to look at the TCP/IP configuration in DOS. So, what's interesting here is that these two DNS servers that I'm somehow configured to use (208.67.220.222 & 208.67.220.220) are definitely the servers of OpenDNS, so we don't want to use them. Ever. But where did they come from? I decided to go into my router configuration and see what that looked like. So, these DNS server addresses are widely documented to be OpenDNS server addresses. But it doesn't allow me to check "Automatic from ISP" box above, for some reason. The problem is that since my "Connection Type" is set to "Static" in the Belkin My Essentials ME1004-R Router, it won't allow me to modify the DNS Server addresses. So, I click on "Connection Type" and change the Connection Type from "Static" to "Dynamic". 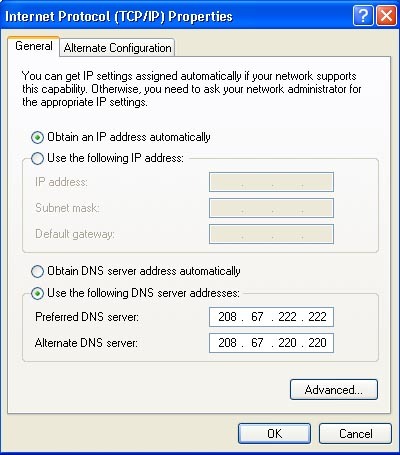 Changing the Connection Type to Dynamic cleared out the DNS server addresses. Now the Automatic from ISP box can be checked. Checked the "Automatic from ISP" box and wait for router to reboot. Now, it prompts me for DNS Server Addresses. The router reboots, and now the router is fixed. It's working fine now. Rebooted the PC upstairs, and now it's fixed. I no longer see the dreaded OpenDNS routers listed in my DNS servers. Upstairs PC is working fine. But then, I go into the configuration of one of my downstairs PC's, only to discover that the OpenDNS DNS servers are in the TCP/IP configuration of the computers downstairs. Great. OK. The trick here is that you have to do essentially the same thing we did with the router...change it to "dynamic", change the DNS servers to "dynamic", and then re-enter our static IP address data. 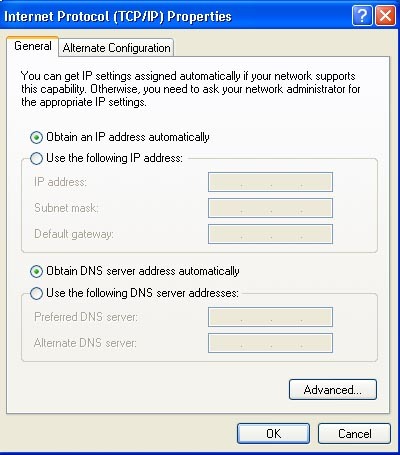 Select "Obtain dynamic DNS server address automatically". Re-enter the static-ip address information. 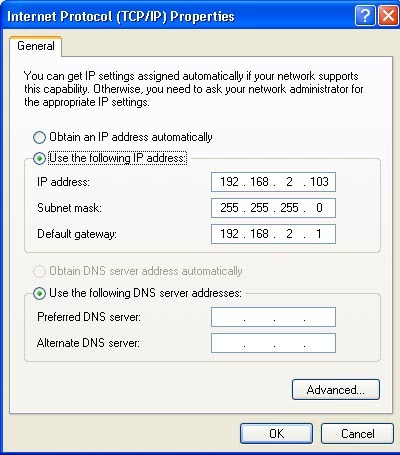 Initially, I tried saying "Obtain DNS server address automatically", but then I couldn't find any websites. So, to resolve this issue, I copied the "Preferred DNS Server" and "Alternate DNS Server" data from another PC.